Two weeks of homeschool are under our belts. Is it early days? Sure, not to mention my parents were in town last week, so things were a bit more stay-cation-y than they would have been. We took that as a “deschooling week,” and while there was a worksheet here and there, we also kicked off by enjoying a place we’ve wanted to visit for awhile, Brookgreen Gardens. We only enjoyed a portion of this beautiful and historical place that’s pretty much in our backyard… a storybook playground, a small kids’ discovery center, and a zoo of local animals. We plan to go back to enjoy the Sculpture Garden soon. The things I wanted most to change for us by making this decision are changing. More focused attention. Better sleeping (9am is soooo much better than 6am…). Better eating (I’m getting into cooking lunch…). Time to explore. Time together. There have been a few surprises. The biggest one was on the first “official” day, when Kaity came downstairs in a dress. Kaity does not wear dresses. Later in the week, when my parents took her shopping, she picked out a new dress and a nightgown. Only thing I can figure is she feels very safe. She doesn’t like to be fussed over for looking pretty (Cool or amazing, yes. Pretty, no). She knows we won’t. I love the conversations I get to hear them having with each other and with others. I love that they had no electronic devices to play with for the past 4 days and stopped asking after the first day. I love that P.E. has been riding bikes, together with me pulling their baby brother in the bike trailer, and part of their writing has been letters to cousins and friends. (Don’t forget to mail them, Kelly). One day this week, Rod asked us to go to lunch together. We headed to our favorite local sports bar, where our manager friend told us his wife had homeschooled their children. Then, over nachos and wings, after we schooled Rod about the origins of Halloween we had learned that morning, we semi-spied on a Red Hat Society lunch taking place in the dining room. 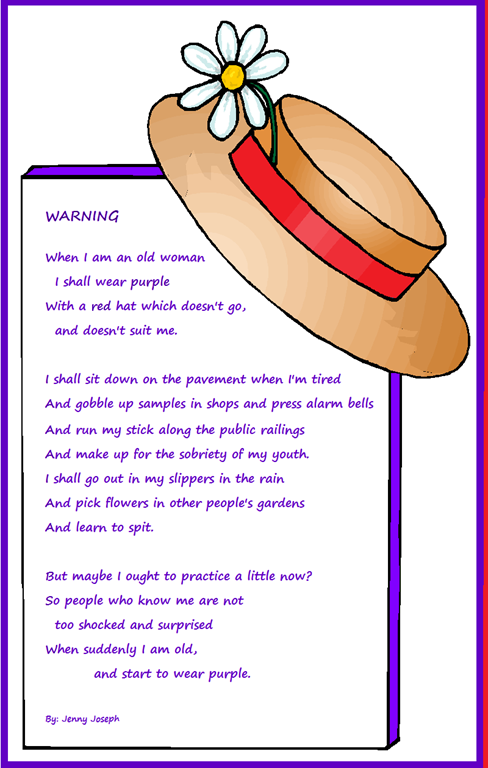 Miranda just happened to be wearing a purple dress, so I told her about “When I am old, I shall wear purple…” and asked the girls if we should go crash the Bingo and merriment. The prizes looked really cute. That’s it, you guys. That’s the kind of natural, “the world is our classroom” experience that is my goal for our learning together. And this is an almost-nine-year old girl pretending she’s not giddy about that purple gift bag. We have several field trips with other local homeschoolers scheduled. We are flexible people. It’s where we thrive. So when we haven’t done social studies yet and friends want to play, we play. When I have a work project that needs 45 more minutes, they read or color a little extra while I finish. When there wasn’t time before church for reading, they read me poems in the living room afterwards. It is working for us, and I’m glad we took the leap! Before the rain came last Monday (yes. The metaphorical rain I prayed for was delivered! ), I made a decision. It was always in my soul to do, but a series of “God winks,” confirmations, and my own heart opening my head up to possibilities, it has been reaffirmed over and over to me over the past weeks. When we moved to Myrtle Beach, it was a given that I would have a position in our new business venture. It was a new career step for me, and while it was exhilarating, challenging, and at the same time ego-crushing and ego-boosting. And as I recorded here, transitioning from being a work-at-home mom was so hard. and then began attending a truly wonderful school where they have been loved on and where they have grown and learned and made friends. My ‘mommy-guilt’ was replaced by a dependency on their school, as it became one of the few constants in their lives – and mine! – over the past six months. But when it became time to really start thinking about schools for the fall, when Miranda will need to start kindergarten, I found myself dealing with a different frame of mind: avoidance. We had a few options, and none of them were jumping up and screaming, “We are right for you!” There is the public school, and the bus that comes to pick up our sweet neighbor boy at 6:45 in the morning. There are several Christian schools, none in great locations from our current house ‘in the boonies,’ and all with rules about skirts (4 year olds having to wear them and middle-schoolers not being allowed to wear them seems a bit against the laws of nature to me), and the one most appealing to me cost twice as much as the others. The factors that seemed to surround our decision included our geographic location (we are basically in an unincorporated area that is close or on the way to nothing), our unknown job situations (just a week ago, we were unsure where Rod would be working and whether or not I would need to work and if so where that would be and then what sort of after-care we might need for the girls and of course, whether we could afford private school), and who I have as a support system. Almost every mom I know here works full time outside the home and/or has kids older than mine. All my close friends who are homeschoolers-of-little-ones are back in Illinois. And there is also the question of my own confidence. It’s been a little rocked by decisions gone sour. Three or so weeks later, I can’t recall the exact moment that it hit me again, like truth. I only remember the series of moments that confirmed it. The sight of Miranda sounding out words with Kirsten on the couch. The friendly librarian who interrupted our reading time to admire it. The preacher whose prophetic words to me were not about my career path or our ‘big thing,’ whatever that might be, but about my own intelligence and ability to train my kids. You know what my reaction to all this was? Duh. I am going to homeschool my girls next year. – money? Don’t need it. I already own the curriculum, and even if I didn’t, I’ve learned a lot about homeschooling for free. – location? Home. The beach. The library. The state park. Trips to Chicago and Florida and Charleston and North Carolina and Lexington and other places when we can. Since we’re learning about the world, why shouldn’t we see it? Nothing I taught Miranda during our home-preschool time came so alive as the first day I was able to show her the horizon line over the ocean. Suddenly, the idea of the heavens and earth being separated was illustrated before her eyes. Homeschool=everywhere school. – dress code? We are all finding our own style around here. It’s part of learning and part of growing into who we are, for the girls and for me. – work? Thankfully, God has provided a job for Rod that is going to meet our needs and settle our concerns. While I have some opportunities before me, they will have to fit in around the anchor of homeschooing my children. They are my job, they are my calling, they are my ministry, first, for this season of our lives. – support? Well, my HS friends in Chicago are as much an intimate part of our lives as ever, as we can be with 1000 miles between us. I have a strong group of friends here now as well, including past homeschoolers. There is a well-rooted co-op in town that I am reaching out to. And who’s to say which of our family members will be living here by fall…? –time? This is the one that makes me the most nervous, because the projects on the horizon for me will require me to work and meet deadlines. This is the one that I must work through with my husband and ‘support team’ and godly wisdom. And this is also what will show our family’s unconventional tendencies… Because whatever work I do, my kids are going to be a part of it. There are so many other positive aspects in my head… the freedom of our schedule… the freedom in our finances… the ability to discover so much about nature, culture, industry, history, and faith with my kids… the time to allow them to follow some of their individual interests, like dance and instruments and swimming. I am so excited about where we are heading. it hasn’t led me astray yet.